This is the first installment of a position-by-position preview of the 2019 NFL draft. The sweet spot for running backs in the NFL draft will be late in the third round and into the fourth round. Seven to 10 backs could be selected between the 75th and 138th picks, by the time the fourth round ends. It’s not a good year for elite backs. There’s nobody close to the class of Saquon Barkley, who went No. 2 overall last year. The top back is Alabama’s Josh Jacobs, and he might only squeak into the late part of the first round. But that’s not unusual. Over the past six years, only eight backs have been drafted in the first round. There may only be two backs taken in the first two rounds. Over the past five drafts, an average of eight backs have been picked in the third and fourth rounds combined. That’s where you get good value. 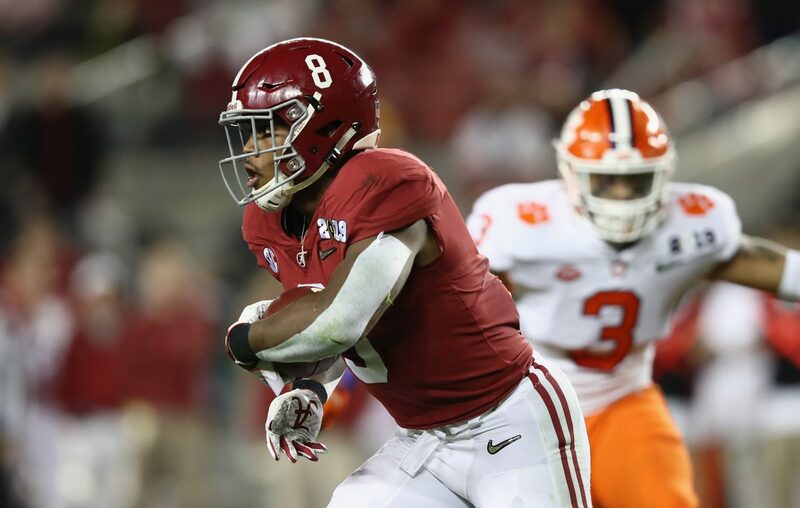 The Best: Josh Jacobs, Alabama. He is a classic, no-nonsense, physical Crimson Tide running back who should be a productive pro. He’s not particularly big, at 5 feet, 10 inches and 220 pounds. He’s the same size as Kareem Hunt. But he runs hard. Because of Alabama’s ridiculous depth, he only had 251 attempts for his career. He carried 15 times in only three college games. In 2018, he carried 120 times for 640 yards, third on the team. He’s good between the tackles, can get to the edge and catches the ball well. Bills view: Running back is on the Bills’ priority list, but it’s not a necessity. The Bills have no need for a first-down back, with LeSean McCoy and Frank Gore on the roster. They signed special teamer Senorise Perry, who has a pretty good shot to make the team. The other two runners in the fold are Marcus Murphy and Keith Ford. Patrick DiMarco is the fullback. What is that group missing? A situational speedster or another quality third-down option. Taking a running back in the middle rounds is a distinct possibility. Speedy Darrell Henderson of Memphis would be ideal but might go way too early for the Bills. Super receiver James Williams of Washington State or Texas A&M’s Trayveon Williams could be a steal for the Bills in the fourth round. Looking long term, the Bills aren’t likely to have McCoy or Gore beyond this season. However, running back is one position at which you can get away without planning for the future. The Bills easily could remake their backfield room in one offseason via free agency and the 2020 NFL draft. Still, be on the lookout for a back. Third-down ace: He might not rank in the top 10 of many RB draft lists, but teams looking for a third-down receiving back might target Washington State’s Williams early on Day Three. He caught 83 passes in the Cougars' pass-happy offense. He also shows pretty good blitz-pickup ability despite a lack of size at 5 feet and 9 1/2 inches. WNY connection: Pittsburgh’s Qadree Ollison, the Niagara Falls native and Canisius High School graduate, is a late-round or undrafted free agent prospect. The 6-foot-2-inch, 228-pound Ollison rushed for 1,211 yards as a freshman then got stuck behind current Steelers star James Conner in the Pitt backfield. Ollison stayed patient and produced a superb senior season, rushing for 1,213 yards and 11 touchdowns. Injury risks: Stanford’s Bryce Love and Oklahoma’s Rodney Anderson have elite talent but are recovering from injury. Love rushed for 2,118 yards and 19 TDs in 2017 and was the runner-up for the Heisman Trophy. He tore knee ligaments in December. He’s not a tough, between-the-tackles runner, but he has breakaway ability and could thrive in an outside zone scheme. Anderson showed his ability by running for 201 yards against Georgia in the 2018 Rose Bowl. But he’s had season-ending injuries three of the last four years. He tore an ACL in September. Sleeper: Wes Hills, Slippery Rock. Dominated at Division II in 2018 with 1,714 yards at 7 yards per carry and 17 TDs. He also caught 28 passes. He started his career at Delaware. He’s a Day Three pick. 1. *Josh Jacobs, Alabama, 5 feet, 10 inches, 220 pounds. Another hard-running, every-down ’Bama back who will be a good pro. 2. *Darrell Henderson, Memphis, 5 feet, 8 inches, 208 pounds. Explosive, home-run hitter who rushed for 1,909 yards at 8.9 per carry in 2018. 3. *Miles Sanders, Penn State, 5 feet, 10 inches, 211 pounds. Sat behind Saquon Barkley but is tough runner with elite talent. Ran for 1,247 yards in ’18. 4. *David Montgomery, Iowa State, 5 feet, 10 inches, 222 pounds. Between-the-tackles RB who rushed for 2,925 yards, caught 71 passes for career. 5. *Devin Singletary, Florida Atlantic, 5 feet, 7 1/2 inches, 203 pounds. Undersized RB who lit up mid-major level: 4,684 scrimmage yards, 67 TDs. 6. Damien Harris, Alabama, 5 feet, 10 inches, 216 pounds. North-south RB who posted three straight 1,000-yard scrimmage seasons. 7. *Justice Hill, Oklahoma State, 5 feet, 9 1/2 inches, 198 pounds. Home-run hitter topped RBs at combine in 40 (4.40 seconds) and VJ (40 inches). 8. *Trayveon Williams, Texas A&M, 5 feet, 8 inches, 206 pounds. Short, well-built back with 3,615 career rush yards and good pass protection. 9. Bryce Love, Stanford, 5 feet, 9 inches, 200 pounds. Former 2,000-yard rusher suffered a torn ACL in December. 10. *Elijah Holyfield, Georgia, 5 feet, 10 inches, 217 pounds. Son of the boxing legend (Evander), he has the toughness you’d expect.